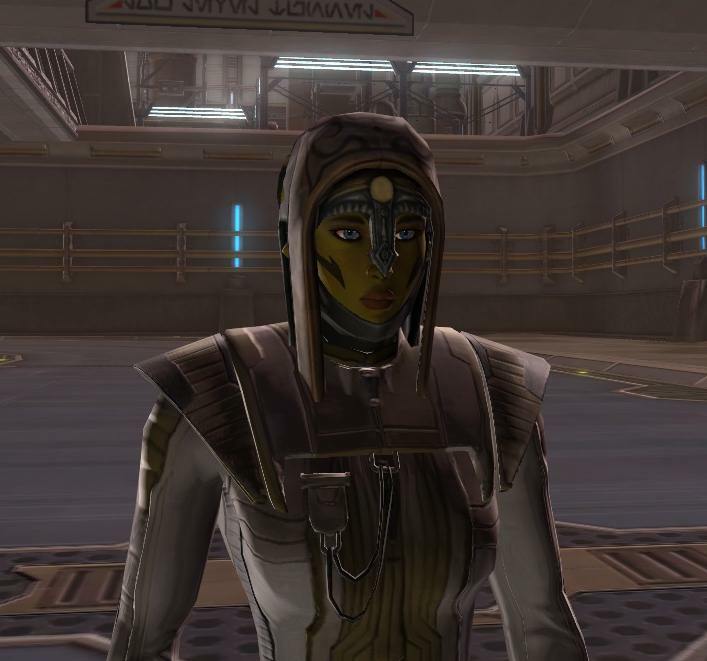 This is the first post in my 10 Days of SWTOR Screenshots challenge. Click on any screenshot to see a larger version. Bugs in raids are rarely fun, because often they prevent you from killing bosses even if you are capable, or they make you jump through unnecessary hoops just to be able to re-attempt the fight (such as resetting the whole instance and clearing the trash again - I'm looking at you, HM Fabricator and pre-1.2 HM Ancient Pylons). However, every now and then you do get a laugh out of one, such as in this case, where a trash mob in Karagga's Palace somehow became immune to damaging abilities but was also perma-stunned at the same time - so he just stood there, twitching helplessly and keeping us in combat. 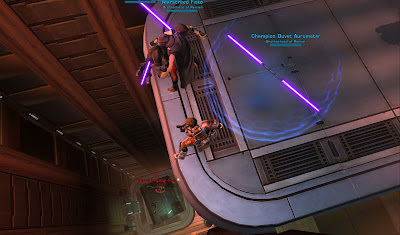 We eventually managed to resolve the issue by punting him off a nearby elevator shaft where he died from the fall damage, which we thought was most amusing. As an aside, I'm not sure my guild leader is supposed to be nothing but a floating double-bladed lightsaber either. 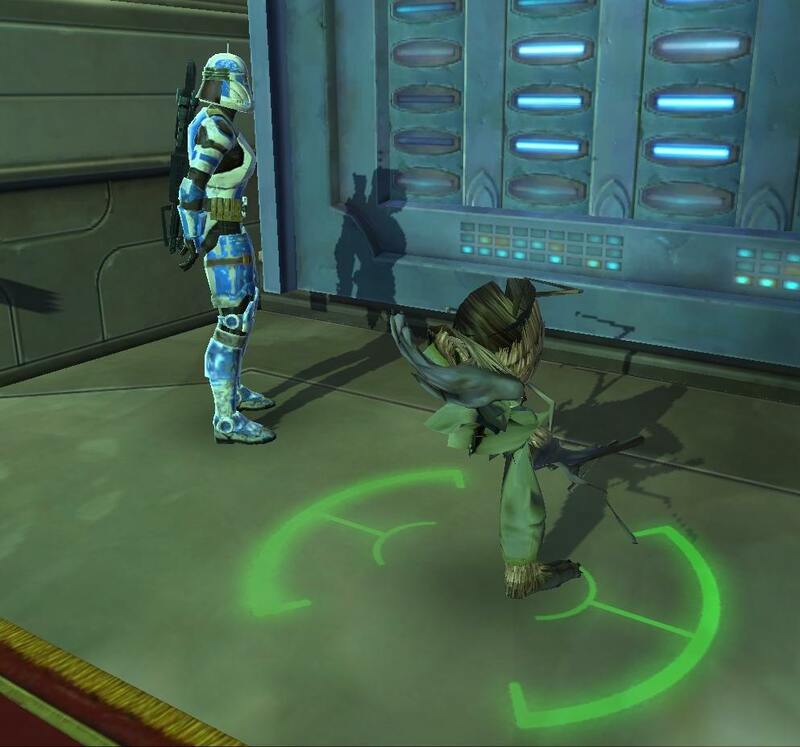 On Corellia you meet an alien race called the Drall (as Republic anyway), or as I refer to them, "the guinea pig men". On my consular I got to go into a library that was full of them, but they didn't all look entirely well. I mean, I see a leg, but everything else looks kind of... inside out? 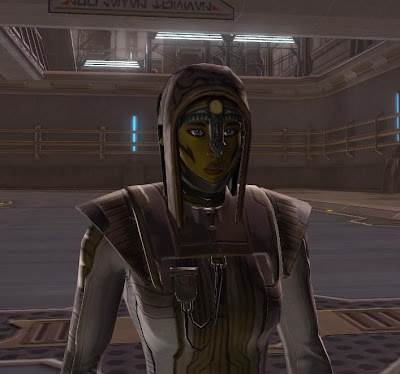 This one might've been a graphics glitch more than a bug, but I still found it most unsettling: my twi'lek's lekku disappeared while questing in the Black Hole! And no, that didn't just make her look like a normal person with green skin... it was just wrong.